As the 7th pay commission to be implemented very soon, the rates of gratuity of all the central govt. employees are also recommended to be revised. 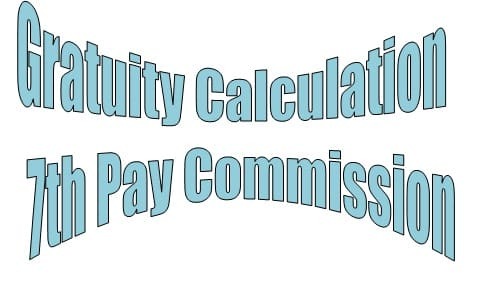 The existing gratuity calculation and the ceiling on the total amount earned on gratuity are fixed by the currently applicable 6th pay commission. Although the date of implementation of the 7th pay commission was been announced as 1st Jan, 2016, it will soon be implemented within few months. Gratuity is a onetime amount paid by the Govt. to its employees in case they resign or retire from the job. But he / she must complete at least 5 years of employment for being eligible to receive the gratuity. In case of death, the gratuity is provided before five years also. As per the recommendations of the upcoming 7th pay commission, which was scheduled to get implemented from the 1st of January, 2016, the Govt. is keen to revive the amount of gratuity ceiling for the central govt. employees. New recommendations suggest that the Govt. is going to enhance the ceiling on the total gratuity to Rs. 20 lakh per employee. So this is the maximum amount that will be paid as gratuity to employees. Gratuity ceiling means that that amount is the maximum amount that an employee might get after leaving the service within a stipulated period or after complete retirement or in case of death of employee during service. In case of death, the gratuity amount is given to the family of the employee. What was the existing ceiling on gratuity? As per the existing pay commission i.e. the 6th pay commission, under which the salaries, pensions and other employment benefits of the central govt. employees are decided, the gratuity ceiling is also calculated. The existing ceiling on the gratuity amount as per 6th pay commission is Rs. 10 lakh. This amount is the maximum, an employee is eligible to get after discontinuation of service. The 6th pay commission was implemented from 1st Jan, 2006. The earlier gratuity ceiling before 6th pay commission was Rs. 3.5 lakh. The pay commission has got several suggestions regarding the increment of the gratuity simultaneously with the increment of DA of the central govt. employees. The gratuity index should be calculated according to the percentage of DA which is admissible at the time of retirement of the employee. As per the 7th pay commission, the Govt. might implement the rule of increasing the gratuity with increasing DA. As per the recommendations, a 50 per cent increase in DA might bring a 25 per cent increase in the total gratuity at the time of retirement of the central govt. employee. The gratuity related explanations and rules are described in the CCS rules or commonly known as the Pension rules, applicable for the central govt. employees. The calculations of the gratuity are explained in the CCS Rule book’s, Rule 49 and Rule 50. There are slabs of service years mentioned along with the rate of gratuity of the central govt. employees for gratuity calculation in these rules. In case of death of the central govt. employee while in service, they family of the employee is eligible to get the gratuity amount which will be calculated as per the latest rules explained in the pay commission. The death gratuity is calculated as per the length of service and the monthly emoluments which means the basic salary added with DA, ration allowance, transport allowance and others. There are separate slabs of service periods defined by the Govt. and the death gratuity calculation base on those slabs. As per the current 6th pay commission, in case of death of the employee before one year of service, the rate of gratuity admissible is twice of the monthly emoluments. There are four slabs on the lengths of service according to which the rate of gratuity in case of death are being calculated. The second slab is in case of death between 1 – 5 years of service. Here the gratuity amount will be the monthly emoluments, multiplied by 6. The third slab of service period is 5 – 20 years. Here, 12 times of the net monthly emoluments will be provided as gratuity. The last slab is service period of 20 years or more service. Here if the employee dies after doing 20 years of service, for every 6 months, half the monthly emoluments will be taken for consideration to calculate the total death gratuity. A maximum of 33 times of monthly emoluments in total might be considered for death gratuity calculation. The third slab of length of service which was earlier 5 years – 20 years is recommended to be broken down in the new 7th pay commission and an added slab will be introduced in between. This will become beneficial for those govt. employees who’s service period was between the latter half of the existing slab. As per 7th pay commission, if the length of service is 5 years to 11 years, then the death gratuity will be month emoluments, multiplied by 12. And further, if the length of service is more than 11 years and within 20 years, the death gratuity calculated will be the monthly emoluments multiplied by 20. Why there was a need to change the gratuity rates and calculations in 7th pay commission? As per several recommendations and suggestions, there were several anomalies on the existing gratuity rates and ceiling of the central govt. employees. Earlier the total ceiling on gratuity of the central govt. employees was Rs. 10 lakh only. This was considered to be not serving the purpose of death gratuity. The gratuity amount was higher for the higher ranked officers as they had a high rate of monthly emoluments. The consideration of the DA with the gratuity was not there too. There was also a need to revise the slabs of the period of service. The 5 years to 20 years service period slab needed to revise as it was not very beneficial to the employees regarding gratuity calculations.